I'm from Barcelona, and once a year I go to Costa Brava on the Mediterranean with my friends to enjoy good food and nice weather. I always carry my camera with me to capture the beach when the light is just right, take photos of my favorite meals or document my latest hike. When I get home, I upload my photos to Panoramio and position them on the map. Pictures uploaded to Panoramio can be featured in the “Photos” layer of Google Earth and Google Maps, which means that I can share my travel experiences with others and, in return, explore places around the world through the eyes of other photographers. Starting today, you can share your passions through photographs more collaboratively with Panoramio Groups. This new feature lets you create a sub-community within Panoramio around a topic you’re passionate about, so you can easily engage with like-minded photographers and hobbyists. 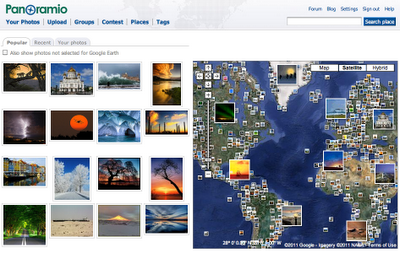 Panoramio is an online community of people that share and explore photos of the world. For example, in my trips around the world, I always take the time to enjoy the local cuisine, like Costa Brava’s arròs negre. So I created a group called “Food,” to give others a "taste" of that region and get a glimpse of what fellow foodies are feasting on. My fellow group members—and by all means I hope you’ll become one of them!—can add their own photos, browse others' and get culinary and travel inspiration. 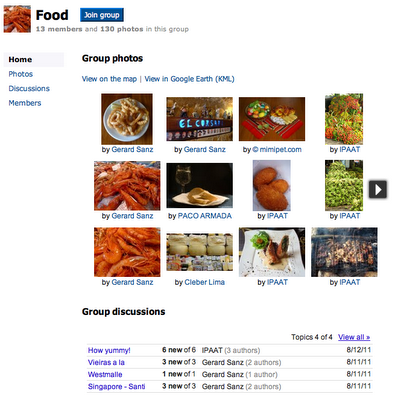 Panoramio Groups allow members to share photos and start discussions on a given topic. To share your own interests and passions through photos, hop over to Panoramio and create your own group or join an existing one from the Groups Directory. You can show off your photos of your favorite restaurant, the most beautiful sunset you’ve seen, the latest lighthouse you’ve visited, or the cutest dog from each continent. Whatever it is, try starting a discussion about your favorite topics and share what matters to you with others. Visit www.panoramio.com/groups to get started. 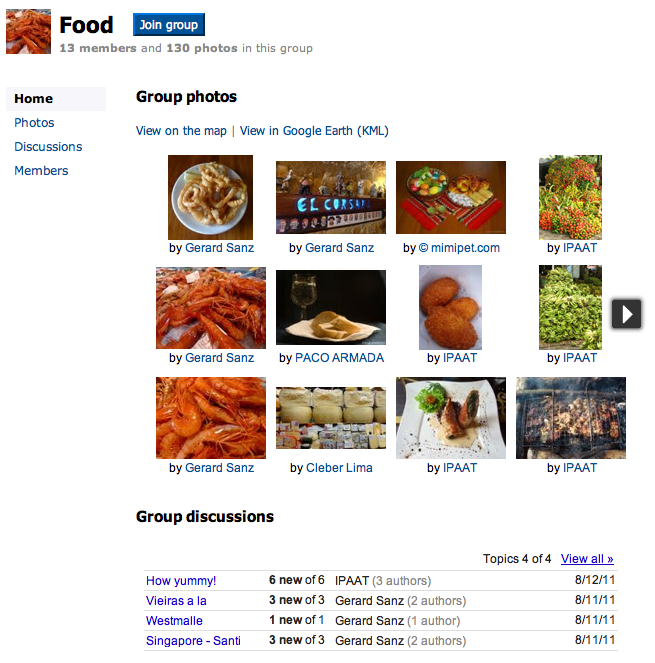 We hope you enjoy this new addition to Panoramio—let us know what you think in the Panoramio Forum!